Sovereign States Liberty Watch Group – Page 2 – Getting back to what they intended our way of government to be!!!! the position of commissioner of Internal Revenue and enacted an income tax to pay war expenses. Supreme Court ruled it unconstitutional the following year. necessary to amend the Constitution. The 16th Amendment gave Congress the authority to enact an income tax. …………………………………………………………………………………………………………………………..
As you can see, according to the IRS, the Supreme Court ruled the income tax unconstitutional in 1895. They point out that the Sixteenth Amendment gave Congress the authority to enact an income tax. They failed to give the underlying details of what led to the approval by the Supreme Court of an income tax. In 1909 Congress passed the Corporation Tax Act of 1909 and at the same time passed the Sixteenth Amendment and sent it out to all of the States for ratification. They failed to give the interpretation of the term “Income”. See Presentment VI for definition of “Income”. CRS is well-known for analysis that is authoritative, confidential, objective and nonpartisan. Its highest priority is to ensure that Congress has 24/7 access to the nation’s best thinking. Authorizing the preparation and printing of a revised edition of the Constitution of the United States of America—Analysis and Interpretation, of decennial revised editions thereof, and of biennial cumulative supplements to such revised editions. Building upon deﬁnitions formulated in cases construing the Corporation Tax Act of 1909,14 the Court initially described income as the “gain derived from capital, from labor, or from both combined,” inclusive of the “proﬁt gained through a sale or conversion of capital assets”; 15 in the following array of factual situations it subsequently applied this deﬁnition to achieve results that have been productive of extended controversy. ……………………………………………………………………………………. 1 157 U.S. 429 (1895); 158 U.S. 601 (1895). 2 Ch. 349, § 27, 28 Stat. 509, 553. 3 The Court conceded that taxes on incomes from “professions, trades, employments, or vocations” levied by this act were excise taxes and therefore valid. The entire statute, however, was voided on the ground that Congress never intended to permit the entire “burden of the tax to be borne by professions, trades, employments, or vocations” after real estate and personal property had been exempted, 158 U.S. at 635. 4 Springer v. United States, 102 U.S. 586 (1881). 5 Ch. 173, § 116, 13 Stat. 223, 281 (1864). 6 For an account of the Pollock decision, see “From the Hylton to the Pollock Case,” under Art. I, § 9, cl. 4, supra. 7 173 U.S. 509 (1899). 8 178 U.S. 41 (1900). “In the course of the argument, the Federalist has been quoted, and the opinions expressed by the authors of that work have been justly supposed to be entitled to great respect in expounding the Constitution. No tribute can be paid to them which exceed their merit; but in applying their opinions to the cases which may arise in the progress of our Government, a right to judge of their correctness must be retained; and to understand the argument, we must examine the proposition it maintains and the objections against which it is directed. The subject of those numbers (from the Federalist papers) from which passages have been cited is the unlimited power of taxation which is vested in the General Government. The objection to this unlimited power, which the argument seeks to remove, is stated with fullness and clearness. It is that an indefinite power of taxation in the latter (the Government [p434] of the Union) might, and probably would, in time, deprive the former (the Government of the States) of the means of providing for their own necessities, and would subject them entirely to the mercy of the National Legislature. As the laws of the Union are to become the supreme law of the land; as it is to have power to pass all laws that may be necessary for carrying into execution the authorities with which it is proposed to vest it; the National Government might, at any time, abolish the taxes imposed for State objects upon the pretense of an interference with its own. It might allege a necessity for doing this, in order to give efficacy to the national revenues; and thus, all the resources of taxation might, by degrees, become the subjects of federal monopoly, to the entire exclusion and destruction of the State Governments. It has also been insisted that, as the power of taxation in the General and State Governments is acknowledged to be concurrent, every argument which would sustain the right of the General Government to tax banks chartered by the States, will equally sustain the right of the States to tax banks chartered by the General Government. VI. Internal Revenue Service – Proof Documents Showing the Method of Collecting Income Taxes on the earnings of the citizens of the member States in the Union. I am listing the IRC Section, Description and CFR Title giving the regulations for that Section of the IRC. Please check the Parallel Table of Authorities above to verify the following. To find which CFR Title interprets a section of the IRC, scroll down the list of IRC sections until you find the IRC section in question. There you will find the section of the CFR that interprets that section. If its not CFR 26, the IRS has no authority to enforce that section of the IRC. In plain, simple, down-to-Earth terms, the Constitution of the United States of America created two ponds of water. One pond in which the Federal government functions, and one pond in which State governments function. If you want to go swimming, swim in the water where the Federal government is not allowed to function. That way the IRS tax sharks can’t take a bite out of your earnings!!! The government that our founding fathers structured and built for us was the result of coming out of a union of thirteen independent Colonies that was not working. It had not produced the results they expected. With that fresh on their minds and knowledge of what was on the other side of the waters lying in wait to take them down, they devised a plan of government to provide the people with strong general government with absolute power over its sphere of sovereignty but no power outside of its sphere of sovereignty. Sovereignty begins with the people! That sovereignty is divided into three separate and distinct parts and it takes all three to make up the whole. To the State (Colonies) governments they placed the protection of the citizens and residents within their respective territorial limits. This protection extended to the right to life, liberty, and the pursuit of happiness. The right to life includes everything necessary to keep body and soul together. The right to liberty includes everything necessary for them to move about freely, unrestricted by any means. The right to pursue happiness has been understood to be equivalent to property rights. These rights, they pointed out, were God given and not acquired. 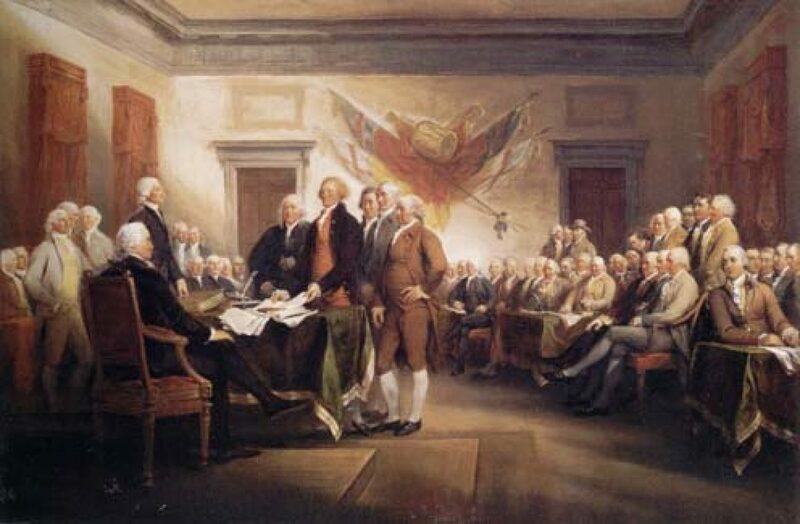 The Declaration of Independence declared those rights and the Constitution established a government to secure the blessings of those rights to the people. The purpose of the Constitution was to make plain the limitations of the newly formed government in defending the rights declared In the Declaration of Independence. The only restriction being that they could not infringe upon someone’s right to enjoy those same rights. To the general government, United States in Congress, they placed the protection of State citizen’s rights from being infringed on by powers of a foreign nature whether it be by invasion or otherwise. The only time the general government could step foot inside a State in regards to the State’s citizens, relative to matters outside of its delegated powers, would be at the request of its Governor or someone functioning in its capacity. The remainder of the people’s sovereignty, they kept for themselves. Their sphere of action was and is to provide for the health and wellbeing of their families and communities. “We have in our political system a government of the United States and a government of each of the several States. Each one of these governments is distinct from the others, and each has citizens of its own who owe it allegiance, and whose rights, within its jurisdiction, it must protect. The same person may be at the same time a citizen of the United States and a citizen of a State, but his rights of citizenship under one of these governments will be different from those he has under the other. Slaughter- House Cases, 16 Wall. 74. Experience made the fact known to the people of the United States that they required a national government for national purposes. The separate governments of the separate States, bound together by the articles of confederation alone, were not sufficient for the promotion of the general welfare of the people in respect to foreign nations, or for their complete protection as citizens of the confederated States. For this reason, the people of the United States, ‘in order to form a more perfect union, establish justice, insure domestic tranquility, provide for [92 U.S. 542, 550] the common defense, promote the general welfare, and secure the blessings of liberty’ to themselves and their posterity (Const. Preamble), ordained and established the government of the United States, and defined its powers by a constitution, which they adopted as its fundamental law, and made its rule of action. The fifty States have citizens of their own and the United States, in a territorial sense, has citizens of its own. State citizens are citizens of the State in the Union in which they are domiciled, while United States citizens are citizens of the States under its exclusive jurisdiction which are the District of Columbia, Puerto Rico, Guam, the Virgin Islands, American Samoa and any other lands within its jurisdiction providing that those citizens are subject to its jurisdiction. (Foot Note 1) The laws of the United States only apply to its citizens, the citizens of the Several States in certain instances and any other entity subject to its jurisdiction as defined by the Constitution and clarified by its laws and United States Supreme Court decisions relative to its jurisdiction. Regarding territorial jurisdiction, there are two things that are territorial in their nature, taxation and criminal procedure. A look at USC, Title 18, Part 1, Subsection 5 and 7 will help clarify the meaning of the term United States and the extent of its Special Maritime and Territorial jurisdiction regarding criminal activity. Please read all of Subsection 7 for other details of importance. The term “United States” can be understood in any one of several ways. The only understanding of the use of the term United States that requires governing and regulation is as it relates to its territorial jurisdiction. As you can see below, all legislation of Congress does not apply to within the States unless a territorial extent clause exists that says that that law applies to within the Several States. The general government is made up of the Legislative, the Executive and the Judicial branches of government. The Legislative branch includes the House of Representatives and the Senate. The Executive branch includes the President, the Vice President and the Presidential cabinets. The Judicial Branch includes the Supreme Court and such inferior courts as the Congress may from time to time ordain and establish. The House of Representatives represent the people of all the member States in the Union. The Senate represents the governments of all the Fifty States. The members of the House of Representatives are supposed to be chosen by the people of all the States while the members of the Senate are supposed to be chosen by the legislatures of the Several States. The President is supposed to be chosen by electors that are chosen by the legislatures of the Several States, not by the people. Regarding the choosing of national representatives in government the State legislators represent the State governments in the choosing of the Senators and the President and Vice President. The Senate is where the State governments are united while the House of Representatives is where “We THE People” of all the States in the Union are united. The President of the United States is the President of that entity that was created by the people of all the States and not the president of any of the States or of their citizens. We have Governors to see that our laws are carried out as our State legislatures intended for them to be. The method of choosing the members of the general government has been changed because of the negative effects of political parties that have been allowed to commandeer our political processes. Our founding fathers warned us time and again of the dangers of allowing political parties to gain control of our political processes. The political parties that have commandeered our political processes were not provided for in the Constitution and have been the vehicles through which foreign powers are gaining control of our government to some extent. There are two kinds of taxes that the US Constitution allows – direct and indirect. Indirect taxes are taxes based on the performance of some privilege or activity that is rightfully regulated by the federal Government. Direct taxes have been held by the U S Supreme Court to be taxes on land and property or assets because of ownership. The U S Supreme Court has ruled that the Income Tax is a tax on corporations for the privilege of doing business in corporate form. The amount of the tax is based on the total income received from doing business in corporate form. If you are not incorporated then you don’t owe the Income Tax. Your earnings are your property and are not subject to the Income Tax. This site is all about the History and Purpose of the Sixteenth Amendment. All of your United States and State Representatives and Senators believe the Sixteenth Amendment to be what authorized the U S Congress to tax your earnings. The U S Supreme Court says otherwise!!! For more information go to http://sovereignstateslibertywatchgroup.com. In plain simple down to Earth terms, the Constitution of the United States of America created two ponds of water. One for the Federal government to function in and one for the States’ governments to function in. If you want to go swimming, swim in the water where the Federal government is not allowed to function in. That way the IRS tax sharks cant take a bite out of your earnings!!! Now comes we the people, not the people of any political party but as We The People of the United States of America, in concert, appealing to our legislatures for relief from the undue tax burdens placed upon us by the powers that be. Our prayer is to the Almighty God of the Earth, the God of Abraham, the God of Isaac and the God of Jacob and for the Legislatures of the member States in the Union to serve notice to the Federal Government to halt, effective immediately, its practice of assuming powers and imposing mandates and laws upon the citizens of the member states in the Union for purposes not enumerated by the Constitution for the United States of America. WHEREAS, We see in 118 U.S. 356 – Yick Wo v. Hopkins that the Right to Life, Liberty and the pursuit of Happiness that was given by God to the People of these united States is safeguarded by the fact that sovereignty remains in the people under God. WHEREAS, The people have divided their sovereignty into three separate and distinct spheres of action. The right to enjoy Life including everything requisite to the maintenance thereof, Liberty and the Pursuit of Happiness, they reserved to themselves. WHEREAS, The Sixteenth Amendment was approved by Congress on July 2, 1909 after the Corporation Tax Act was enacted in that same year to sustain the the provisions of the Corporation Tax Act. The Congress shall have power to lay and collect taxes on corporate incomes, from whatever source derived, without apportionment among the several States, and without regard to any census or enumeration. RESOLVED, That the secretaries of state of the member States in the Union forward copies of this Petition to the Governors of the member States in the Union, to the speaker of the House of Representatives and the President of the Senate of the United States Congress, and to all the members of their State delegations to the congress with the request that this petition be officially entered in the Congressional Record as a memorial to the Congress of the United States of America. We, The People of these United States, in concert, humbly request that our State government representatives accept our petition and hear our resolve regarding these matters. In support of this petition, with a firm reliance on Divine Providence, we hereby ascribe our names in good faith believing that our representatives will take appropriate action for the benefit of State government revenues and on behalf of their constituents. I, __________________________, affirm that all signors above are from the State listed. When this Petition is completed, send the original to Citizens Support Group, keep a copy for yourself, and mail a copy to your State Representative and a copy to your State Senator. CSG will forward certified petitions to your State’s Secretary of State. This procedure will allow us to ensure that our voice is being heard.